Lawyers in Tamil Nadu have been on protest against newly amended rules under the Advocates Act, 1961. The Madras high Court in Chennai through an order dated 25.05.2016 amended the advocates act to regulate the conduct of lawyers. (i) An advocate who is found to have accepted money in the name of a judge or on the pretext of influencing him; (ii) an advocate who browbeats and abuses a judge or judicial officer; (iii) an advocate who is found to have sent (or) spread unfounded and unsubstantiated allegations/petitions against a judicial officer (or) a judge to the superior officer. (iv) an advocate who actively participates in a procession inside the court campus and /or is involved in gherao inside the court hall;(v) an advocate who appear in the court under influence of liquor. Advocates who will be found guilty under these rules will be debarred from practice in any court and it also empowers the high court to order an interim suspension without any inquiry. M.K.Gandhi once stated that “A lawyer by his profession is an advocate of people’s rights, an expert in law and politics and one who saves the victims of Oppression by the State”. Advocates have played a vital role in societal change. 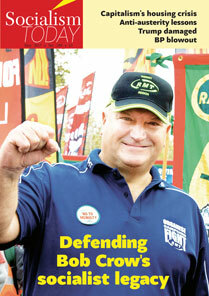 Many leaders including Karl Marx and several fighters of the working class are from the legal profession! They fight against oppression of state in the courts and also in the streets. They represent victims of custodial & state violence, caste violence, labour rights, etc., in the courts. The advocates act and various conventions of the U.N guarantees this right to practice of lawyers without any fear in the courts and it is also duty of advocates as a judicial Officer to fight against judicial corruption. But the present rules will only curtail this vital function of lawyers and protect the judges against corruption. These rules will help to hide their corruption. In the state of Tamil Nadu both AIADMK and DMK are considered to be corrupt and presently don’t take the major issues of public in the center stage through agitations. Apart from Communist parties in Tamil Nadu advocates has been a major force in raising various issues of people. Advocates and law students spear headed the struggle when there was genocide of Tamils in Srilanka, against caste atrocities, protests against laws banning eating beef. The advocates all over Tamil Nadu boycotted courts for 3 months and also protested against the proliferation of state run TASMAC liquor shops, and for the implementation of common education etc. These often mount pressure on the ruling parties and now both parties are silent on these issues as many cases against them are pending before High Court and Supreme Court. The ruling political, bureaucratic and judicial classes are against the radical lawyers. Lawyers presently are fighting against judicial Corruption and for transparency in appointment of Judges for a certain period. They had alleged rampant corruption in judicial appointments. Due to their consistent struggles the Supreme Court had to send back the list of appointment recommended by the chief justice of Madras High Court, S.K.kaul in 2015. Advocates had employed various modes of struggle to highlight their cause. Young radical progressive lawyers are in the forefront in this struggle. Apart from the struggles in Madras High Court there had been struggles in various subordinate courts against corruption. The advocates of Madurai high court protested against helmet rule passed by high court and called to revoke the order, and to implement it only after providing proper infrastructure and by educating people through awareness campaign. 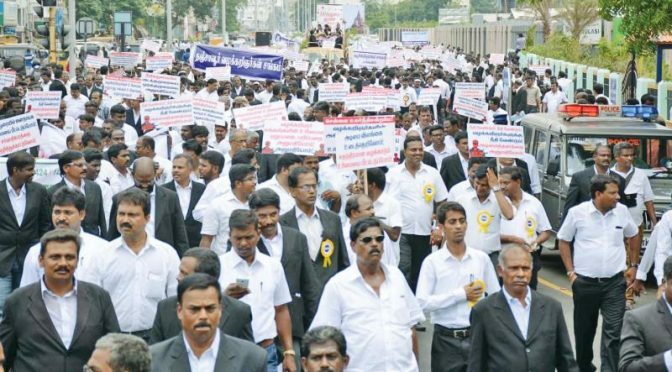 In the month of September 2015 advocates did a silent protest in the Chief Court at Chennai to make “Tamil as an official language of the Court”. They were arrested and remanded for 50 days and later suspended from practice by the BCI without any Disciplinary enquiry as mandated by the Act. Along with these advocates about 44 other advocates from Chennai and Madurai were suspended from practice in the same manner for fighting against judicial corruption and transparency in Judicial Appointments. The advocates of Tamil Nadu followed a non violent approach as their path of struggle but they are suspended from practice for the past 1 year without any allowance. Advocates Act hasn’t got any provision related to subsistence allowance unlike the labor and service rules for workers. Thus the judges colluded with the BCI and state bar council to debar these lawyers from practice. Media, press and the ruling class has manufactured public opinion among people that advocates are criminals who violate law and the need to curtail them. In a capitalist system no sector is free from crime. Institutional failure cannot be reason in curtailing the right of advocates to practice without fear. These rules are only meant to silence the lawyers and to protect and perpetrate corruption in the judiciary. The struggle against these rules started on June 6th through a rally in Chennai where thousands of advocates participated and it was continued by boycott of courts by the advocates. The struggle is organized by the JAC (Joint action committee of lawyers).The protest reached its peak on 25 July when thousands advocates all over Tamil Nadu laid siege to the Madras High Court. On 24th July the BCI again suspended 126 more lawyers from practice to intimidate lawyers from their plan of gherao. But their plan was foiled and advocates went with their struggle. In the meeting on 28th July at Thanjavur, JAC has decided to continue the boycott until the rules and 170 suspensions are revoked. To completely revoke the amended rules made under S-34(1) OF Advocates act. Revoke the illegal suspension of 170 advocates from practice. Appointment of judges in a transparent manner to check judicial corruption and applying Social Justice Principle of reservation in Judicial Appointment.